On Dec. 21, 2007, Army Sergeant Bryan Camacho, serving as an Infantryman with the 1-87 Infantry, 10th Mountain Division, was searching for an ammunition cache with his unit in Hawija, Iraq, when another patrol in a nearby village was hit by an improvised explosive device (IED). SGT Camacho and his unit were attempting to respond when his vehicle ran over a secondary IED. The blast threw SGT Camacho from the turret of the vehicle, breaking his back and paralyzing him from the waist down. 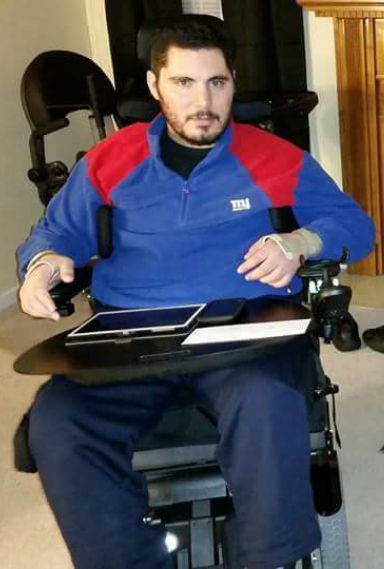 Once back in the United States, Bryan underwent rigorous therapy at the Hunter Holmes McGuire VA Hospital in Richmond, Va., and the Kessler Institute in West Orange, N.J. After a year and a half of hard work, Bryan became completely independent in a manual wheelchair. A few years later, Bryan faced a major setback in his recovery. On Nov. 15, 2014, Bryan’s adapted truck spun out on ice and rolled into a ditch, breaking his neck and paralyzing him from the neck down. The injury took away the independence Bryan worked so hard to regain. Despite overcoming two injuries, Bryan continues to pursue his hobbies and interests. He works with a roller derby team that raises money for local animal shelters and children’s programs. He enjoys attending church and going to movies and concerts. Though Bryan strives to lead an active life, he still experiences restrictions within his own home. Because of the limited accessibility in his current living situation, Bryan has to stay in bed most of the time. A custom specially adapted Homes For Our Troops home with an open floorplan and accessible bathrooms and shower will give Bryan more independence. “In a better environment I will be able to get out more and pursue my hobbies,” he says.